After the recent advent of gluten-free diets for most of our family, breakfast became a terrible challenge. I began spending my mornings in the kitchen baking gluten-free pancakes and muffins, cooking gluten-free hot cereal, or whatever else I could think of for my hungry little people. I would barely get the kitchen back in order from a long breakfast ordeal before it was time to get school work going, then start over again with lunch. My sister Julie spent a few weeks in our home earlier this year (before she moved in with us), and promptly decided I needed a slightly more do-able plan for breakfast. I was game for something simple! 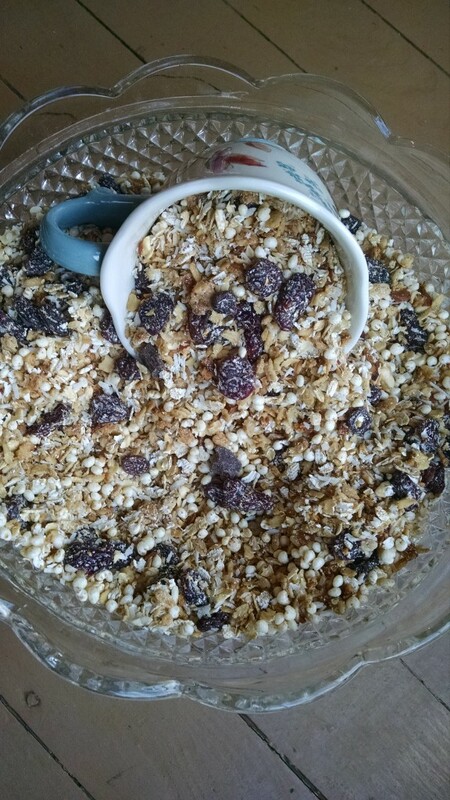 The result of a little experimenting and tweaking over the last few month is this homemade muesli. Muesli is simple to make, healthy, crunchy, and delicious! Unlike granola, muesli does nothave to be baked or cooked. Traditionally, muesli includes oats as a base. If you’re sensitive to oats, opt for a gluten-free cereal as a base and add your own healthy fillers. The addition of milled flax, dried fruit, almond butter, and other healthy ingredients not only makes this “cold cereal” stretch further, but also adds protein and fiber. I like to start my muesli with a few cups of left-over homemade granola as a base, but you can just go with raw oats (or whatever cereal you choose) if that’s what you have on hand. Homemade muesli is less expensive than store-bought boxed cereal and much more filling and nutritious. We love it! Three-year old Mr. K and I enjoy this homemade muesli several times a week, and Mr. C is starting to eat it, as well. I still bake gluten-free pancakes or banana bread muffins once or twice a week, and we enjoy hot cereal several times a week, as well. Normally, making a big batch of homemade museli is one of my Monday projects. For busy, summer time mornings, this quick and healthy cereal is a life-saver! Place oats in a large bowl. Set aside. In a small sauce pan, warm oil and almond butter over medium heat; stir until almond butter melts. Remove from heat and stir in honey until smooth. Add cinnamon and a dash of sea salt. Stir until all ingredients are smooth and well combined. Pour liquid mixture over cereal and stir with a wooden spoon until well coated. 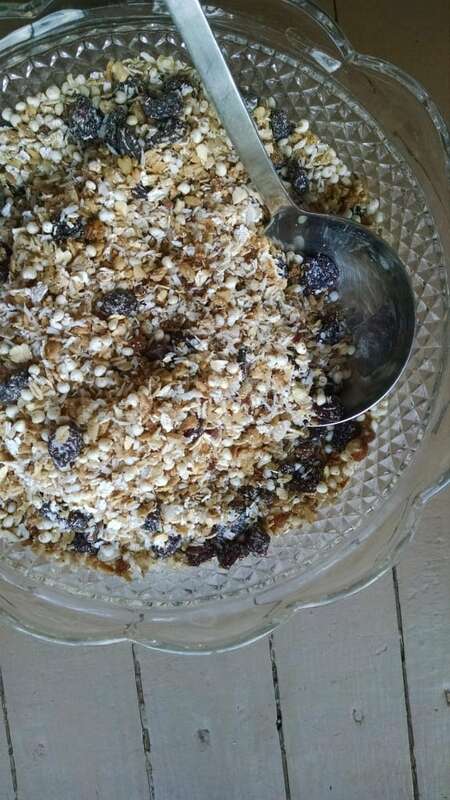 Fold in raisins, milled flax seeds and chopped walnuts. Store in an air tight container. Serve with milk or almond milk and enjoy! This recipe can easily be varied with the addition of coconut, mixed dried fruit, banana chips, sliced almonds, sunflower seeds, etc!